Finally. The overdue debut of Zaid Nasser, and boy is it a great one. Zaid Nasser (pronounced �zayd�) is one of the most authentic voices on saxophone today. As the son of jazz and blues great, bassist Jamil Nasser (ne� George Joyner), Zaid was born and bred on the jazz scene. As a young saxophonist, he often spent his days with Papa Jo Jones, getting lessons in jazz and life from Father Time himself. Early on, he was sitting in with Lou Donaldson and George Coleman. He has been on the New York scene now for nearly twenty years. He's played with Cecil Payne, Junior Cook, Jon Hendricks, and Harold Mabern. He spent three years with Calvin Newborn's band in Memphis, crisscrossing the south and playing in roadside juke joints, developing a rich, deep sound all of his own. Zaid worked for three years with organist Bill Doggett, and spent another three with Panama Francis in the Savoy Sultans. At the original Smalls under Mitch Borden, he was a regular feature for nearly a decade, leading his own quartet, co-leading a quintet with altoist Mike Mullins, as a sideman in the Across 7 Street Septet, and as a part of the Frank Hewitt�s legendary Saturday late night quintet. He was earlier featured on two tracks as a part of Jazz Underground: Live At Smalls on Impulse Records (IMPD245). His talents have also been recognized by saxophonist/producer Ned Otter and included on his album The Secrets Inside (TF004CD) released by the Two And Four Recording Co.
Zaid's sound is organic and authentic. He plays smart music with a kind of freedom that is unusual, reminiscent of the great underground alto saxophone legend Clarence �C� Sharpe. 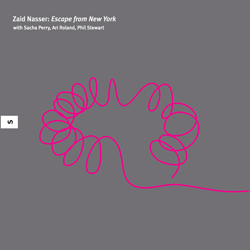 Nasser�s unique personal tone and phrasing reveal intricately crafted, imaginative, and ingenious musical lines, woven into tight thematic improvisation. Though he goes for broke each time out, he never loses his balance, and never slips into the musical gutter. His superb agility in navigating through distant keys in his musical travels is one of the hallmarks of the first-rate improviser, one who avoids the modern tendency to lapse into simplified forms. There is plenty of challenge for the listener, and this recording increasingly reveals its brilliance on repeated listenings. You could scarcely wear this one out. As with Frank Hewitt, Nasser�s note choices can be unexpected at first, but make no mistake, his playing is exact down to the finest details. The style of music herein is a form of bop, but it should be clarified that this is not retro music or a throwback to the 40s and 50s. In fact it follows from continued development in the intricate bop idiom in New York over more than forty years since that time. You can hear in Elmo Hope�s final 1966 recordings, for example, a form of bop that did not exist before, and a form that continued in development through a number of key figures, and often in the inner-circles of the New York jazz scene. If you are lucky enough to have heard C Sharpe, or to have caught Junior Cook in his later years, or if you�ve listened to Frank Hewitt, you have some idea of what I mean. These players did not play the bop that was; they continued to grow and develop throughout their careers, and the form of bop they fostered is more advanced over the historical forms, and at least as challenging. That music advances today through the work of a number of players familiar to the original Smalls scene (and this label), such as Ari Roland, Sacha Perry, Chris Byars, Mike Mullins, William Ash, and Zaid Nasser. For this date, Zaid�s working group, comprising longtime collaborators Sacha Perry, Ari Roland and Phil Stewart from Zaid�s working group, join him for this date. They know all of Zaid�s moves and move freely and without hesitation into any musical territory Zaid wants to travel into. Speaking of travels, the title Escape From New York is given to us by Zaid �because it seems that�s what I�m always doing.� He spent nearly three years as a celebrated artist playing in Armenia with talented pianist Vahagn Hayrapetian. At this writing, he is performing in Dubai for a few months. Like Frank Hewitt, he knows something of what it is like to be playing head and shoulders above the pack and still scrounging. You should take that as a sign of his uncompromising artistry. The result is a pleasure to the ears, and his debut here will be a revelation to some. Zaid has few words to contribute to these notes, preferring to let the music speak for itself, which it does, and eloquently. �I�m Zaid Nasser and I am what I am,� he wrote. And that is truly somebody special.